What do warm, bubbly waters have in common with stuffy noses, itchy eyes and headaches? Hot tubs and head colds. Nobody guessed that? 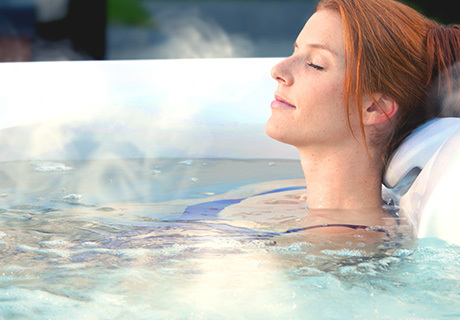 Well, the relaxing effects of hot tubs have been shown to help relieve common cold symptoms. Here’s just a few ways you can use your bubbly tub of relaxation to promote health during cold and flu season. One of the common symptoms of a cold or flu is a fever. Fevers are your body’s way of defending itself from viruses. Soaking in your hot tub to increase your body’s temperature and induce a slight fever can help boost your immune system and stop the cold virus in your nose from reproducing. The next time you need to cleanse your body of harmful germs and viruses, look no further than your own backyard! Sleep is your body’s way of rejuvenating and healing itself. But getting some quality ZZZs when your nose is runny and your body is achy, can be difficult. But there’s good news, soaking in your hot tub is naturally relaxing which can help reduce stress and promote better sleep. Your body responds to de-stressing in the hot tub in the same way that it would during meditation or other relaxing states. Additionally, once you get out of the water, your body temperature decreases which increases feelings of sleepiness. Just one relaxing soak in your hot tub can improve sleep and help your body recover faster. Bodily aches and pains are common symptoms of the cold and flu. Instead of immediately reaching for over-the-counter drugs, relieve your sore body the natural way – with your own hot tub. The combination of heated water and jet massage can quickly increase circulation and relieve muscle tension to reduce those feelings of soreness and fatigue. Why does it always feel like your head is 10 pounds heavier when you have a cold? Congestion can block your nasal passages and put tension on your whole head. If congestion is making it difficult to breathe, eat, or sleep, take a dip in your hot tub. The heated steam from the water can enter your nasal passage to help shrink swollen membranes and loosen congestion. How do you treat your cold? What do you use your hot tub for? What’s your best relaxation tip? Tell us in a comment below!